Bedrooms: 3 "2 up - 1 down"
Bathrooms: 1 "4pce bath on main floor"
Basement: Yes, Full "partially finished - poured concrete"
Size: 1,050 sq. 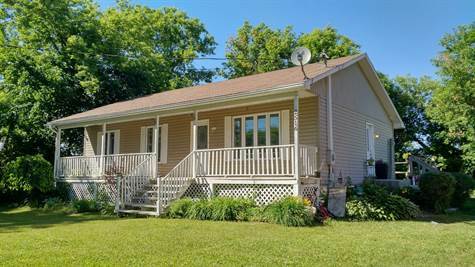 ft. "approximately"
Cozy country bungalow Just down the road from Portland-on-the-Rideau. Perfectly sized with 2 bedrooms up, 1 down - an ultra practical u-shaped kitchen with breakfast nook - a relaxing, bright, living/dining area - and a lower level family room. Outside is just as perfect with a covered front verandah, spacious private yards, tall lilac hedges ... and wide open fields just beyond. The house was built in 1993+/- with many upgrades in 2010+/-. Perfectly priced - perfectly located! Just 20 mins to Smiths Falls/ 45 mins to Kingston. Close to public boat launches/beaches.